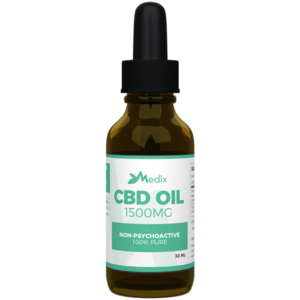 Medix CBD Oil is an infusion of premium CBD rich hemp oil. Their non-flavored CBD hemp oil sublingual tincture contains a prepared formula of 99.9% pure CBD Isolate and pure hemp seed oil. Specifically prepared to be non-psychoactive and cultivated using organic farming practices. The formula used provides natural antioxidants and is Gluten Free and Vegan. Dosages range from 100mg to 4500mg CBD per bottle.